Attend this two-day satisfaction-guaranteed event and enhance your professional skill set while gaining up to 12 hours of CLE, including 1 hour of Ethics. Perfect for your busy schedule, you can choose to attend Day 1 only, Day 2 only, or the full event. 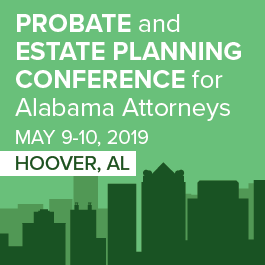 This program features a faculty of leading attorneys, explaining the very latest developments in Probate and Estate Planning in Alabama. Plus, you can earn ALL your annual CLE credit, including one hour of ethics, in just two days! 8:30 a.m. to 9:45 a.m.
11:00 a.m. to 12:15 a.m.
What Is a See-Through Trust? Where there's a will, there's often a war. As an Alabama attorney, are you fully armed for a probate fight? Procedural rules in probate litigation can be confusing, so we’ll help you become more comfortable handling a settlement or contesting a will. In this session, you’ll learn best practices when litigating in probate court. 12:15 p.m. to 1:30 p.m.
Sidney C. Summey, White Arnold & Dowd, P.C. Tanya Shunnara, Sirote & Permutt, P.C. Peter Wright, Sirote & Permutt, P.C. Conference: 8:30 a.m. – 4:15 p.m. Early Bird: $50 off until April 1! CREDIT INFORMATION: This live event has been approved for 12 hours of CLE credit (11 hours of general and 1 hour of ethics). CLE credit is earned only by the individual registrants. Cancellations made after 14 days prior to the event are not eligible for refunds but are eligible for payment transfer (credit) to another BLR/ MLeeSmith.com event, less a $100 cancellation fee. The credit will be valid for up to 90 days from date of cancellation.